LOL-Laughing Out Loud, featuring Demi Moore, Miley Cyrus, Ashley Greene, Douglas Moore…as well as Delphine Pontvieux (who plays the role of Joan of Arc’s mother) is set for a MAY 4 US release. In a world connected by YouTube, iTunes and Facebook, Lola (Cyrus) and her friends navigate the peer pressures of high school romance and friendship while dodging their sometimes overbearing and confused parents. When Lola’s mom, Anne (Moore), “accidentally” reads her teenage daughter’s racy journal, she realizes just how wide their communication gap has grown. Through hilarious and heartfelt moments between mother and daughter, LOL is a fresh coming-of-age story for modern times. 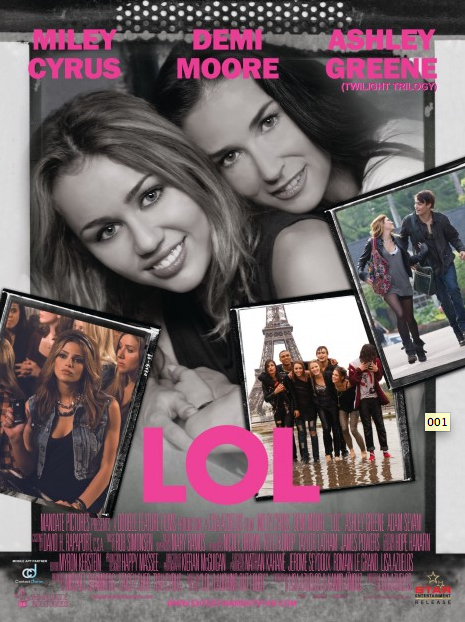 LOL-Laughing Out Loud, featuring Demi Moore, Miley Cyrus, Ashley Greene, Douglas Moore…as well as Delphine Pontvieux (who plays the role of Joan of Arc’s mother) premiered yesterday in India! US release date should be announced soon.